"Your products are absolutely inspired, and I mean inspired by the Holy Spirit. What a blessing your work is to the world." Terra Sancta Guild was the vision and dream of Isadore Serot born April 2, 1927 in Philadelphia, Pennsylvania. Isadore, a man of Jewish faith partnered with Ade Bethune, a well-renowned Catholic liturgical artist, to start Terra Sancta Guild in the fall of 1965. Their vision together was to create and produce beautiful, timeless liturgical items designed for home, church and school. The two worked hand in hand growing Terra Sancta Guild for 35 years until Isadore’s death in July 2000 at age 73. Ade remained engaged with design for Terra Sancta until her death in May 2002. During their 35 years of cooperation Isadore and Ade created some extraordinary works of art for our nation. These include producing the “Tree of Life” Processional Cross for Pope John II’s visit to Denver in 1993 to celebrate World Youth Day. The theme of the first North America Youth Day was “I came that they may have life, and have it in full” (John 10:10). Additional accomplishments included the design of the gold wreath at the base of the Iwo Jima Monument in Arlington, VA and, the “Freedom of Religion” plaque presented to President Ford in 1976. After Isadore’s death, his family continued to operate the business until the winter of 2006 when it was sold to its present owners Maria and Frank Cleary. Frank’s background includes over 21 years in the commercial finance industry with the last 7 years with GE Capital as an Aircraft Finance Specialist. Frank and Maria raised two wonderful son’s, Ryan and Nicholas. Ryan is now an Air Force Senior Airman, and Nicholas works in the family business as a jack of all trades. Frank’s and Maria’s families come from traditional Irish/Italian Catholic roots dating back to the late 19th century. Together, the Cleary’s, and their valued employees, strive every day to bring unrivaled levels of excellence in service to the needs of their customers. We are committed to producing the finest design and workmanship in Christian insignia, architectural commissions, and recognition awards expressive of religious thought for both retail and wholesale. Our expertise in the meaning of Christian symbolism and in calligraphic art and ornament reaches churches, schools and communities all over the world. 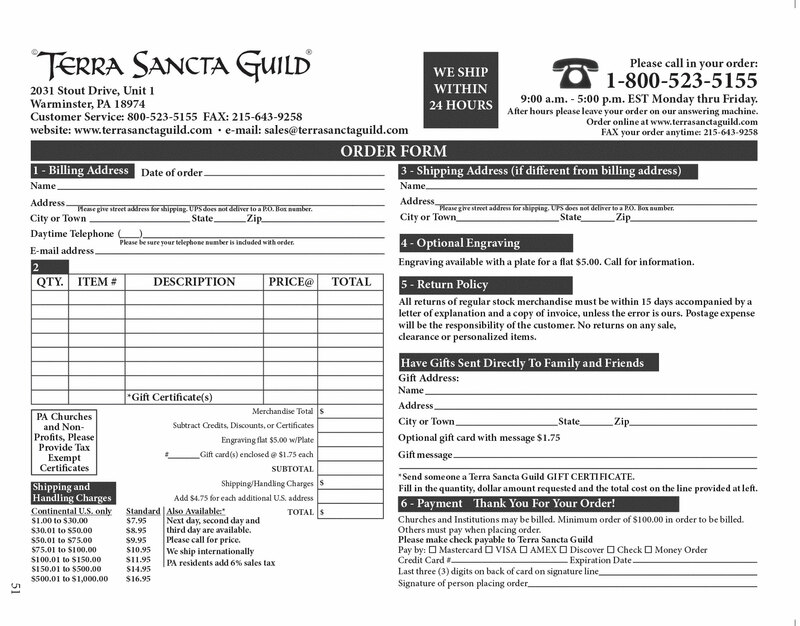 In addition to our in-stock merchandise, Terra Sancta Guild specializes in Custom Design. We will guide you through the process with unparalleled personal service, exquisite design, and cost-conscious manufacturing methods, making us a prime resource for the spiritual community. Terra Sancta manufactures in a variety of metals and finishes such as solid bronze, pewter, sterling silver, and gold plate with enamel colors. Call 1-800-523-5155 to receive a free 40 page color catalog, or to speak to a Custom Design representative. To send an email, visit our contact page.